We all have some sort of fire and passion in our spirit, some people just have it deeper inside and it comes out in different way. 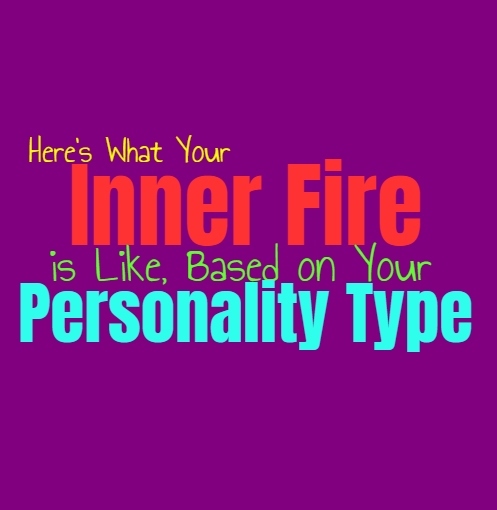 Here is what your inner fire is like, based on your personality type. INFJs are passionate and complex people, but there are parts of them which not everyone sees. They sometimes keep things to themselves and have a hard time completely showing every aspect of who they are. Inside they definitely have a fiery and passionate spirit, inspired and excited by so many things. INFJs are intense about the things they love and believe in, and this is a major part of where their inner fire comes from. They have a way of almost obsessing over the things they cherish, and they don’t just go halfway with it. ENFJs are very passionate people and their inner fire is often something which shines through for people to see. They are expression and excited about the things they love and don’t believe in holding back. When the ENFJ cares for someone or truly is focused on something, they can be rather intense people. Their fire makes them strong-willed and also makes them extremely protective of the people in their lives. This inner fire makes the ENFJ powerful people, who will do whatever it takes to achieve their goals. INFPs are very passionate people with a powerful depth of emotion inside of them. They feel things very deeply and look at the world in their own light, which is something inspired from that sense of inner fire and passion they possess. The INFPs inner fire is what drives them to follow their heart and do what they believe in even when it seems strange to others. INFPs don’t want to pretend to be someone they are not, and believe in always being true to themselves no matter what. ENFPs definitely have a fiery spirit and enjoy living their lives with a sense of passion and excitement. This inner fire comes from both their deep sense of emotions and their powerful imagination. ENFPs have an inner fire which causes them to go after what they want, sometimes jumping into things headfirst without fear. They might not do everything in their lives perfectly, but they aren’t afraid of stumbling for the sake of doing what they love and are most passionate about. The INTJs inner fire comes from having such passionate and hungry hearts and minds. The INTJ also reaches for knowledge and wants to immerse themselves in as much information as possible. This is actually what makes them such strong-willed and passionate people, since they are always striving to learn and grow. For the INTJ it is fulfilling and rewarding to uncover knowledge in a way that others might be hesitant or afraid of. ENTJs are hungry for knowledge but also have a drive which pushes them towards success. Their inner fire is exactly what provides the ENTJ with a sense of strength and passion to achieve their goals in life. They are incredibly capable of figuring out what they want and of doing whatever it takes to go after it. Their inner fire also makes them unapologetic about their goals and helps the ENTJ push towards even when things seem difficult or overwhelming at times. INTPs can be hard for people to truly understand or peg down, because much of their inner fire remains hidden. While this might not outwardly show, INTPs are passionate people with a true depth inside of them. Their inner fire is what drives them to learn and understand things, and to experience life in their own way. INTPs can also be truly passionate about someone they love, and this is often where this inner fire becomes more obvious and prominent. ENTPs inner fire is something which drives them to experience new things and live their lives unapologetically. They are not afraid of expressing their thoughts and don’t hold back simply because it might get someone worked up. Their inner fire makes the ENTP unafraid of experiencing life and making a few mistakes along the way. They search for a sense of freedom and want to be able to make their own choices without having others telling them they shouldn’t. ISTJs are often viewed as hardworking and driven people, but because of this many of their qualities can be overlooked. ISTJs do possess an inner fire, and this is what drives them to work so very hard. They often care about their loved ones more than people know or recognize, and this is what pushes them towards success. They believe in being responsible because they care and because they often have a lot of pressure on them to take care of those around them in a practical sense. The ESTJs inner fire is exactly what drives them to be successful and strong people. They overcome any obstacles in their path, without allowing their fears to hold them back. ESTJs focus on their goals and use this inner fire to propel them towards through anything. This is what provides them with such strength, and helps the ESTJ to continues moving forward when things seem hard or even impossible to those around them. The ISFJs inner fire is something which burns for a sense of belonging. They desire to be important to those around them, and simply want to carve out a special place in their world. This inner fire causes the ISFJ to be deeply passionate about the things and people they love, but they don’t always feel the need to shout this from the rooftops. ISFJs are certainly inspires by the things they love the most, they just don’t express this in an open way like some do. The ESFJs inner fire is one which burns bright for the people and the things they love most in life. ESFJs focus on being there for the people around them, and work hard to be a pillar of strength for those they care for most. They will push themselves past their breaking point in order to ensure that everyone else is properly cared for and loved. The ESFJs inner fire is also something which helps them overcome obstacles, as well as fight for those around them. ISTPs are passionate people who have an inner fire which drives them to experience life. They go after what they want in the moment without constantly being afraid of the future. ISTPs are logical people but at the same time this fire drives them to live in the moment and not hold themselves back simply because they are fearful. ESTPs inner fire is what pushes them to chase their dreams and live with a sense of passion. They want excitement in their lives and don’t want to feel stuck in the same boring place forever. ESTPs are willing to take risks and make mistakes, so that they can feel truly alive. Their inner fire is something which burns bright enough for most to see, and ESTPs are not afraid of being themselves. ISFPs inner fire is something which pushes them to live their own lives, without constantly feeling held back by others. They are free-spirits who believe in going after what they want, even when it seems difficult. The ISFPs inner fire is also what causes them to be themselves no matter what, as they are almost incapable of hiding who they are or holding themselves back from doing what feels right in the moment. ESFPs have a powerful inner fire, one which also burns outwardly in a way that everyone can see. They are passionate people who simply want to seek out joy in their lives, no matter what seems to be threatening to keep them down. ESFPs live their lives in the moment and follow what they love and are most excited by. They don’t live their lives in fear, instead they do whatever inspires them most even when it seems scary to others.